Gnashing, clenching and grinding teeth is referred to as Bruxism. Occasional teeth grinding does not usually cause harm. When grinding teeth occurs on a regular basis, then teeth can become chipped, worn or broken. Many people think that they never or rarely clench or grind their teeth, others, insist they only do it during the day time when they are stressed, yet others feel they used to do it and no longer do. Daytime teeth grinding is usually controlled by awareness of the habit and training to stop certain detrimental jaw movements. Night-time bruxism is a great deal more damaging, and very few are truly aware that they are performing this habitual movement, and it requires professional attention and treatment. 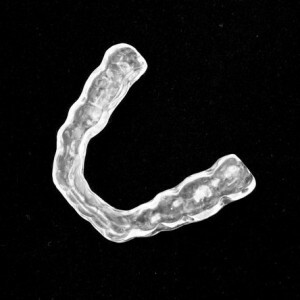 How much force can night-time bruxism place on your teeth? Studies have shown that facial or jaw muscles can clamp down hard during deep sleep. This can be up to 10 times the amount of force during your waking hours. For women this was measured at over 200 lbs of pressure. For men, this was over 500 lbs. of force. What damage can grinding teeth do? Chronic bruxers will often suffer from chipped teeth, broken teeth, worn and often short looking teeth. Gums can recede, bone loss may occur, teeth become loose. The TMJ / temporomandibular joint will also suffer, and boney changes can occur in this area, popping and clicking is reported, limited opening, and worse, pain when an attempt at normal function takes place such as yawning and laughing. Your dentist should assess your condition. They will look for signs and symptoms from the outside in, your facial, head and neck muscles, your teeth alignment and position. It is important to pinpoint the causative factor. For example, is it due to the position of your teeth? Therefore, would you benefit from orthodontic treatment, that is movement of your teeth to a better position to allow improved jaw movement and function. Or do you need treatment with a custom made appliance called an occlusal splint? Dr. Kidess is a Master of the Academy of General Dentistry -”MAGD” and a board certified sedation dentist serving the greater Phoenix, Scottsdale, Paradise Valley, and Tempe, AZ areas. She has been named on the list of “America’s Top Dentists” from 2003 – to Date. If you are concerned about grinding teeth and are interested in bruxism treatment, contact Dr. Kidess today at (480) 991-2290 to schedule an appointment.